First of all, Happy Father’s Day to all of you amazing dads and husbands our there. I love this day because we get to focus on all the amazing dads and father figures our lives. I married into an amazing family. Not only are they some of the most fun and kindest people you will ever meet, they have some of the best recipes. Every summer we go up to Bear Lake to visit and stay in my husband’s family’s condos. Without fail, this “Bear Lake Trail Mix” makes its appearance. His extended side of the family is HUGE! Like 71 people huge so LOTS of food is a must when we get together. My first encounter with this trail mix was in 2007. Derek’s aunt Kimberly brought it to the reunion and I was amazed that I hadn’t ever seen or thought of it before. Such a simple recipe, yet it VANISHES almost as fast as it is opened. 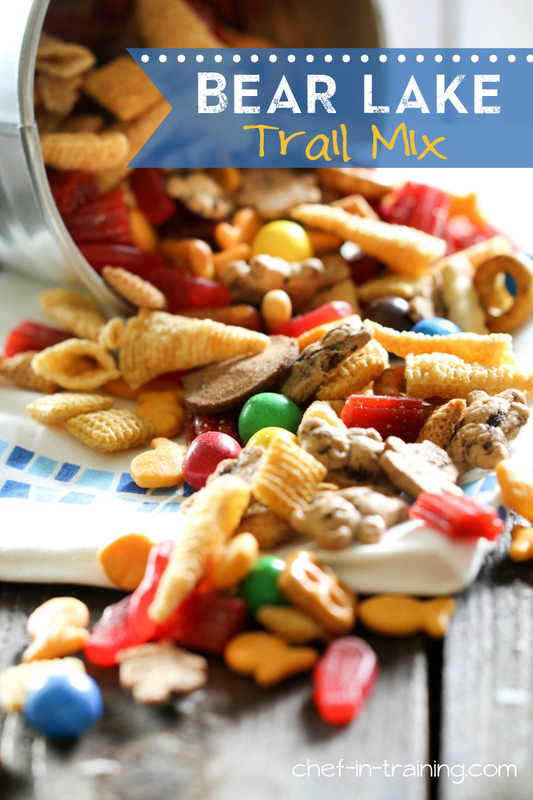 The thing that makes this trail mix a crowd favorite, is that every component in it are snacks that people LOVE! It is completely adaptable to your family’s likes and preferences. This Bear Lake Trail mix got its name purely because that is were it originated for me, you can call it whatever you would like. (My sis-in-law, Sarah from High Heels and Grills, married into the family a couple years ago and posted the yummy recipe on her blog as well. In fact, I wish she were here with me right now to chow down on some!) but since I have been chowing on it for 6 years, I figure I might as well share its goodness with you, too. The perfect snack for any road trip, vacation or snack food craving! The perfect mix of everything delicious! Combine all ingredients together into a large bowl and stir to evenly distribute ingredients. Wow, that looks so good!! What a perfect snack to tak along on summer camping trips and picnics! I love the sweedish fish in there. Trail mix and I are best friends. It comes with my everywhere. I like to pick out all the peanuts first! But I think the Swedish fish would beat the peanuts. I love them! This is crunchy, sweet, salty heaven! Just bought all the supplies to make this! The husband can't wait! We will be in snack heaven! I would not be able to keep my hand out of the bowl ALL DAY. Yummy! Love bear lake!! Even though it's soooooo cold!!! I'm totally making this for our Bear Lake trip in a few weeks! So fun!! Sweet and salty - love it! Great post and photos! This includes everything my 5-year old loves! We're heading out on a road trip/vacation next month, so I'm definitely packing some of this to take with us! Is it an 18.75 oz or 8.75 oz bag of chex mix? I was only able to find an 8.75 oz bag. This is soooo good! Thank you for this. I made up a huge batch for when the cousins arrived and they tore right through this. I'll keep it around all summer. Thanks again! I will have to try this just because it is called Bear Lake trail mix! ;) We spent nearly every summer there when I was a child and now my Dad lives there year round and it is the place we have family reunions as well! Thanks for sharing. Does the Chex Mix have peanuts? I'm looking for a trail mix for a bunch of hungry young women! I know of one with a peanut allergy. We call this monkeychow! Purina Has pet food mill nearby. We tease the kids that is where they make it. we do all kimds of variations.